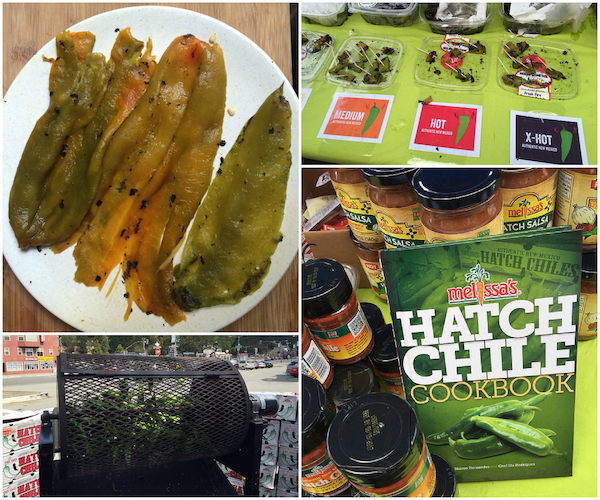 A few weekends ago I went to a Hatch chile roast.Hatch chiles are a very prized New Mexican variety. They are available fresh from August through September and once roasted, they can be kept in the freezer for up to 2 years. They are very high in vitamin C—one medium chile has as much as 6 oranges. There are 5 or 6 different chiles that are marketed with the name “Hatch” and they are each named for the valley they are grown in. The most common Hatch chile is the NuMex 6-4 Heritage, which was bred for flavor, heat level and size at New Mexico State University. They are fleshy, long and narrow. Not generally eaten raw, roasting really brings out their flavor—they are smoky but also have citrus, herbal and vegetal flavors but with distinct heat. You can get mild, medium, hot or extra hot Hatch chiles. A year ago I was sent some hot chiles from The Hatch Chile Store and it has taken me a year to use them. They are really, really hot so a little goes a long way. You might think I had learned my lesson and would get medium heat chiles this time but I did not. In fact the chiles I got from Mollie Stone’s Market supplied by Melissa’s were fresh off the grill and I made yet another mistake, not peeling them with gloves. Ouch! I didn’t feel the sting and burn until hours later. Fortunately it does go away, eventually. You can still attend a 2015 Hatch chile roast at a Bay Area Mollie Stone's Market in September on the 12th in Sausalito, 13th in Burlingame, 19th in San Mateo or 20th in Palo Alto. Preorder them if you like. If you prefer having them peeled for you, you can order them from The Hatch Chile Store. They arrive frozen in a flat package and are easy to remove, one at a time. Disclaimer: I received Hatch chiles from The Chile Store and from Mollie Stone's Market. I was not monetarily compensated to write this or any other post on Cooking with Amy.